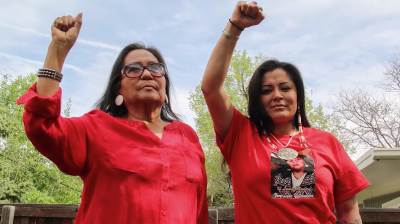 As tensions rose at Standing Rock last fall, Red Fawn Fallis was one of many arrested at the scene of the Dakota Access pipeline (DAPL) protests near Cannon Ball, North Dakota. However, her charges stood apart: Attempted murder of police officers, an indictment later dropped for lesser charges. Still, the claim that Fallis shot at police has stuck in the minds of North Dakotans who may have to judge her culpability and is one reason she could not get a fair trial in the area, her lawyers argue. Attorneys for Fallis, a 38-year-old Oglala Lakota Sioux woman from Colorado, have posited that the case should be moved to a different federal court district. Their argument, made in a pair of recent pre-trial motions for a venue change, revolves around the public relations campaign waged by law enforcement, private security, and public relations firms hired by Dakota Access owner, Energy Transfer Partners. That campaign was headed by firms such as TigerSwan, the National Sheriffs’ Association, Delve and Off the Record Strategies, as reported by The Intercept and DeSmog. The recent motions pushing for a venue shift cite as exhibits multiple documents and emails previously obtained and published by DeSmog and The Intercept, along with other law enforcement communications and media efforts. The exhibits include two emails and a talking points memorandum written by the founder and owner of Off the Record Strategies, North Dakota native Mark Pfeifle, who led communications efforts for the Iraq War under the George W. Bush administration. These documents were previously covered in a story by DeSmog. Though Morton County prosecutors dropped the attempted murder charge against her, Fallis still faces charges for possession of a firearm by a convicted felon, civil disorder, and discharge of a firearm during a crime of violence. She was involved in an incident in which she allegedly drew a gun on officers arresting her, while they subdued her on the ground, on October 27, 2016 at the protests against Dakota Access in North Dakota. Fallis has pled not guilty to the charges and her supporters describe her as a pacifist, though in 2003 she was convicted of being accessory to an attempted first-degree murder in Colorado, which is a felony. Fallis’ legal team also points to recent surveys done by the National Jury Project in the counties housing the federal court district, which is based in Bismarck. The defense argues that those surveys — conducted in Cass County, Morton County, and Burleigh County — illustrate that a potential jury pool chosen in this federal court district could be heavily biased against its client. “An attitudinal survey by the National Jury Project revealed that the vast majority of juror-eligible residents … have been exposed to publicity about the anti-DAPL protesters, have formed a negative opinion about the protests and the protesters, believe that the arrested protesters are ‘guilty,’ and cannot be fair and impartial if selected as jurors for the trial of a protester,” reads the June 16 motion for venue transfer. The lawyers representing Fallis also make the explicit legal argument that the conduct of law enforcement and the role the media played in echoing its claims have made it nearly impossible to assemble an unbiased jury pool for the case going forward. “Fallis has presented the Court with substantial evidence of massive, pervasive, and negative media reports, often generated by law enforcement, which have aroused negative community sentiment about the anti-DAPL protests [and] the protesters in general,” her legal team wrote. The survey results collected by the National Jury Project, contend Fallis’ attorneys, make the case for the trial being moved elsewhere under those rules. “The NJP surveys found that as of mid-December 2016, approximately 75 percent of the juror-eligible population of Morton County and 77 percent of the juror-eligible population of Burleigh County stated that DAPL protesters who have been charged with crimes are probably or definitely guilty,” wrote Fallis’ attorneys on June 16. Though the surveys never asked about Fallis specifically, respondents cited her case in answering a question about the potential guilt of protesters. On the contrary, U.S. Department of Justice (DOJ responded on July 28 to the motion to shift venues. The federal government suggested that this issue could be resolved during the jury selection process when attorneys for both sides can eliminate biased jurors from the pool, in the standard court procedure known as the voir dire process. From there, if assembling a fair jury seems infeasible, then a motion for venue shift could still take place, argue the DOJ attorneys. “Because our democracy tolerates, even encourages, extensive media coverage of crimes such as murder and kidnapping, the presumption of inherent prejudice is reserved for rare and extreme cases,” reads the ruling in that case. Further, the DOJ says these surveys have already been cited in a different state-level case (North Dakota v. Kelli Maria Peterson in Morton County) and unsuccessfully, while also arguing that many other juries have been seated on this topic in the area. The DOJ contends that other tools already exist to ensure an unbiased jury. “[M]ultiple juries have been seated in Morton County, North Dakota cases arising from charges related to pipeline protest activity, some resulting in not guilty verdicts,” it wrote. “There are many tools available to the Court to help ensure a fair and impartial jury, including: juror questionnaires; potential individualized voir dire; jury instructions; assembling a larger than normal jury pool; an increased number of peremptory strikes; and importing jurors from outside” the North Dakota federal court’s Western Division. But Mykol Hamilton, a psychology professor at Centre College in Danville, Kentucky, and research director for the American Society of Trial Consultants Foundation, told DeSmog that the motion for venue change was “among the strongest” she had seen in her entire career and a “slam dunk” decision. Hamilton was quick to say that success “depends 99 percent on the judge,” who has the final say in the motion for venue change. She also noted that voir dire is not a foolproof measure, as her research shows that it often serves to intimidate potential jurors into suppressing their actual beliefs. She has come to call this phenomenon “prehabilitation” in her scholarship, wherein a judge, and often the attorneys, will inform prospective jurors they must be fair and impartial, and that it is their duty to put their biases aside. Instead of having people open up about their thoughts and feelings on the case, helping the judge and lawyers understand who would make for a good juror, it intimidates prospective jurors into burying their biases, Hamilton argues. The DOJ attorneys and press team declined to comment for this story, as did attorneys for Fallis.